While I was in Washington, DC for the Dialysis Patient Citizen fly-in, National Public Radio’s Ailsa Chang did an interview with me while reporting on “Access to Your Congressman”. It was a great opportunity to get the word out about DPC and the efforts of dialysis patients to get access to their members of Congress. You can read a transcript of the report or listen to the recording by CLICKING HERE. 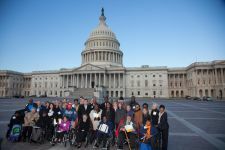 This entry was posted in Access, Affordable Care Act, Dialysis Patient Citizens, kidney, lobbying, Medicare, Uncategorized, World Kidney Day and tagged dialysis, Dialysis Patient Citizens, ESRD, hemodialysis, kidney, patient, treatment. Bookmark the permalink. “For all the campaigning and schmoozing members of Congress have to do, the truth is that the vast majority of Americans will never actually meet their lawmakers. To be fair, not everyone wants to. But among those who do, there’s serious competition for a lawmaker’s time. So, how does an average citizen get access on Capitol Hill? The quick answer: It’s not easy. Did you try to get access? Yes, I should have made that more clear. We met with three Representatives, or rather their staff people, and two Senators’ staffs. We did meet with ONE Representative Marc Veasey of the Dallas area. He was attentive and asked good questions. Congrats on NPR! I’m visiting Texas. What a change in so many years from Oregon! Thank you! And have a good visit. It should be warm here. It’s our several days of spring before the heat of summer arrives. Enjoy!